Simulations staff are Persons of the Month – April 2019 | Command and General Staff College Foundation, Inc. 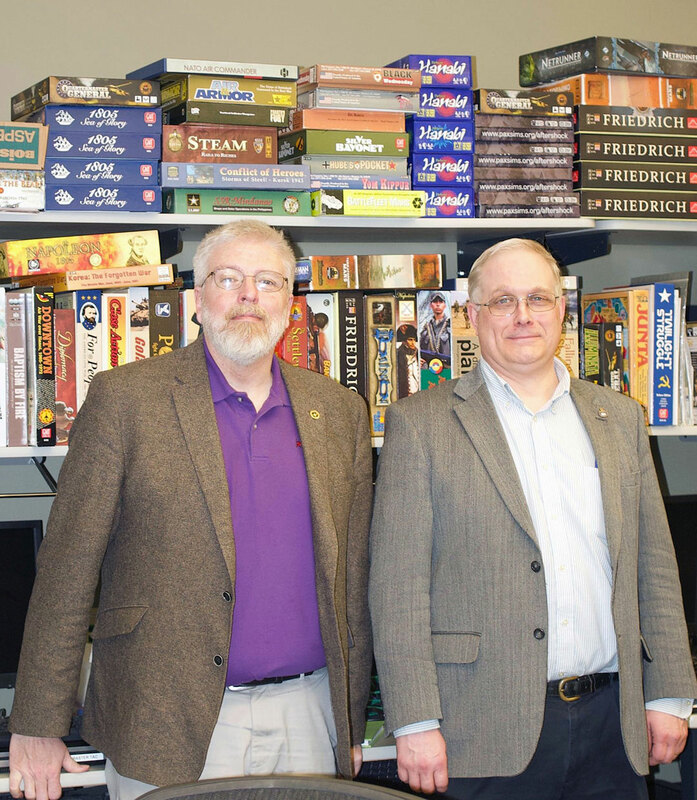 The CGSC Foundation has selected Dr. James Sterrett, Chief of the Directorate of Simulations and Education, and Mike Dunn, Battle Simulations Specialist, for the U.S. Army Command and General Staff College, as the Persons of the Month for April 2019. 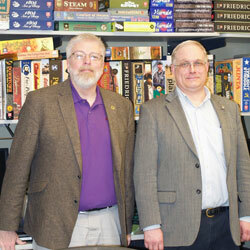 Dr. James Sterrett, Chief of the Directorate of Simulations and Education (right), and Mike Dunn, Battle Simulations Specialist, are the CGSC Foundations “Persons of the Month” for April 2019. Sterrett has been working in simulations at CGSC since 2004 and Dunn has been on the job since 2011. They teach simulations at CGSC for several groups of students including the required elective courses for Army officer students in Functional Area 57 – Simulations Operations, and Functional Area 49 – Operations Research/Systems Analysis. CGSC students who are not FA 49 or 57 also take some of the elective courses. Additionally, they lead the group of CGSC students who enroll in the “Wargame Design Focus” track for their Masters of Military Art and Science research. Another group of students they touch are those that volunteer as “tech leads” for their classes. Sterrett and Dunn train them to help lead the 40 or 50 exercises the classes conduct during each year. Last, and key to the Foundation’s “Walk and Talk” tour program, are the external groups they teach. Sterrett said the Foundation’s visitors are one such group, but others include faculty groups within Army University or groups from other military installations. 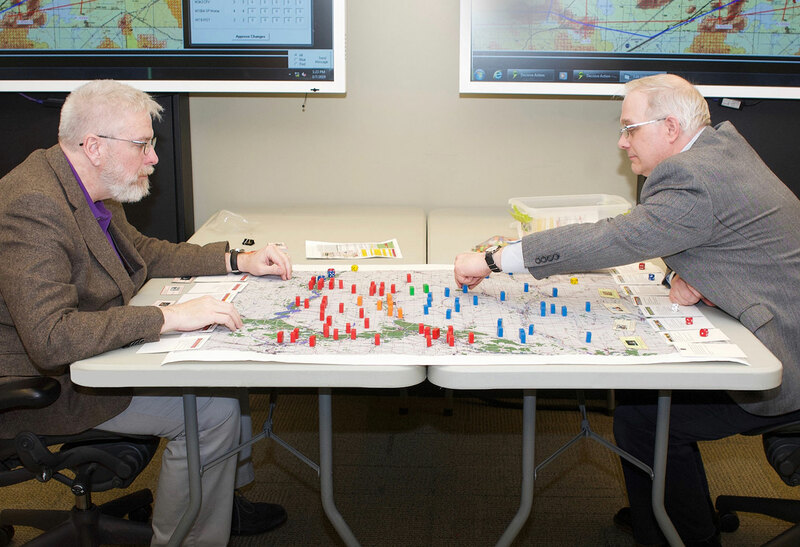 Mike Dunn, left, and Dr. James Sterrett, demo a friendly game of “Fluvius Bellum,” a wargame created by Chris Carnes. Both Sterrett and Dunn themselves are Army civilians in “CP 36,” or Civilian Program 36 – Analysis, Modeling and Simulation, which groups FA49 and FA57 functions together on the civilian side. Sterrett has a doctorate in War Studies from King’s College London and has been part of the CGSC team since 2004. He has also been part of the team for several commercially published games, including the award-winning “Attack Vector: Tactical,” and a tester for many others. 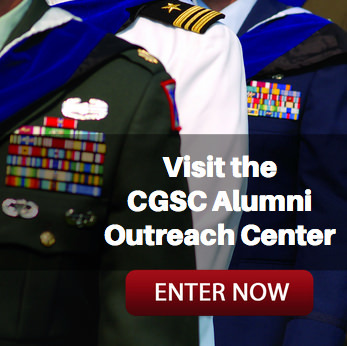 Dunn has been with the CGSC team since 2011. He has an MBA in Information Systems and served in the Army National Guard from 1988-2013 as an armor officer with Functional Area 57. 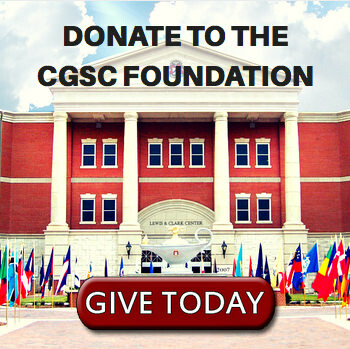 We salute Dr. James Sterrett and Mike Dunn for their contributions and commitment to the Command and General Staff College and the CGSC Foundation mission. – They are truly worthy of our “Person of the Month” honor for April 2019.